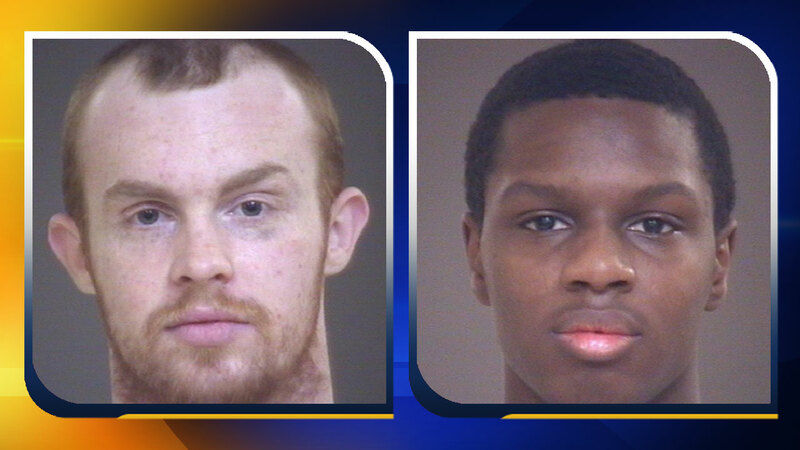 LINCOLNTON, N.C. (WTVD) -- The Lincoln County Sheriff's Department said a worn lock is the reason two prisoners were able to escape from a transportation van in Raleigh Friday morning. Deputies said the door lock bar on a cage inside the van had become worn after years of opening and closing. It prematurely released as detention officers were transporting the inmates, according to officials. "Evidently after travel on the interstate and road vibration it caused the bar to vibrate into the unlock position. When that happened the prisoners were able to reach through a slim opening and release the back door on the van from inside," said Lincoln County Sheriff David Carpenter. According to authorities, two men - 24-year-old Logan Long of Lincolnton and 19-year-old Damarcus Dixon of Charlotte - escaped from a Lincoln County Sheriff's Office transport van. Two prisoners who escaped from a transportation van in Raleigh Friday morning, set off a massive manhunt and put nearby schools on lockdown. The incident started around 9:50 a.m. along Western Boulevard near Interstate 440. Raleigh police officers and Wake County deputies captured the men around 10:30 a.m. - after they ran through a used car lot and down to a side street and into the Kentwood neighborhood. Officials said the unlock knob on the inside of the side and back doors on the transport vans has been disabled and will no longer work from inside.